Heavy Duty Air Hammer Set PHG3050CH4 contains PH3050 Air Hammer, which cuts through various materials by delivering 1,750-2,500 blows per min, flat chisel, double blade panel cutter, tapered punch, and muffler cutter accessories. Universal retainer chuck is also included, allowing operators to safely interchange and engage accessories with air hammer. Plastic carrying case offers multiple storage options for organization and protection. KENOSHA, Wis., Oct. 7, 2004 - With the recent introduction of the Snap-on PH3050 Air Hammer, operators can experience an innovative power tool that offers enhanced comfort and control features, emitting less vibration and producing maximum power. Now, Snap-on Tools Company is offering the versatile PHG3050CH4 Heavy Duty Air Hammer Set, a complementary kit that contains the air hammer along with the most frequently used accessories that pound through a variety of metals and materials. Market research found that auto repair technicians were reluctant to use air hammers because they were physically demanding to operate. Collective data showed that most air hammers generated considerable vibration, were unbalanced and uncomfortable to hold, and lacked enough power to complete jobs quickly. That's why Snap-on developed the vibration reduced PH3050 Air Hammer, a tool that provides enough comfort to help reduce operator fatigue, but enough power to deliver hard-hitting blows to cut through a variety of materials. The company's exclusive use of vibration-fighting dual elastomer cushions reduces vibration in the PH3050 Air Hammer by 300 percent, compared to competitive models. The elastomer cushions isolate vibration similar to the way motor mounts and shock absorbers work, displacing and absorbing energy rather than transmitting it to the user's hand. PHG3050CH4 Heavy Duty Air Hammer Set With the Heavy Duty Air Hammer Set, technicians have increased access to a variety of productivity-enhancing air hammer accessories exclusively designed for the Snap-on PH3050 Air Hammer, a power tool that combines a 40 percent heavier piston, three-inch stroke, hard hitting blows and quick cutting capabilities. Using its four different built-in regulator settings, the PH3050 Air Hammer can strike 1,750 to 2,500 blows per minute. Accessories for the Snap-on PH3050 Air Hammer include a flat chisel (PHG55A), a double blade panel cutter (PHG57A), a tapered punch (PHG59A) and a muffler cutter (PHG87A), which cut through a variety of metals and surfaces depending on the task at hand. A patented universal retainer chuck (PH200D) is also included with the set and allows operators to quickly and safely interchange and engage accessories with the air hammer. A convenient plastic carrying case is standard with the set and offers multiple storage options for quick organization. 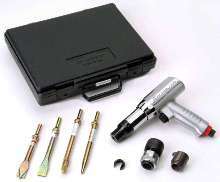 The case holds and protects the air hammer and accessories in easy-to-access compartments and helps make locating and identifying items easy. Both the air hammer and accessories are available together as the PHG3050CH4 Heavy Duty Air Hammer Set or individually. Customers and technicians can find out more about the PHG3050CH4 Heavy Duty Air Hammer Set by contacting their local Snap-on representative, visiting www.snapon.com or calling toll free 877-SNAPON-2 (877-762-7662). Snap-on Tools Company is a subsidiary of Snap-on Incorporated, a leading global developer, manufacturer and marketer of tool and equipment solutions for professional tool users. Product lines include hand and power tools, diagnostics and shop equipment, tool storage products, diagnostics software and other solutions for the transportation service, industrial, government, education, agricultural, and other commercial applications, including construction and electrical. Products are sold through its franchisee dealer van, distributor channels and company direct sales, including snapon.com. Founded in 1920, Snap-on Tools is a $2+ billion, S&P 500 company headquartered in Kenosha, Wis., and employs approximately 12,700 worldwide. Automotive Tool Set comes with mobile workstation. MRAP Repair Kit combines versatility and security.